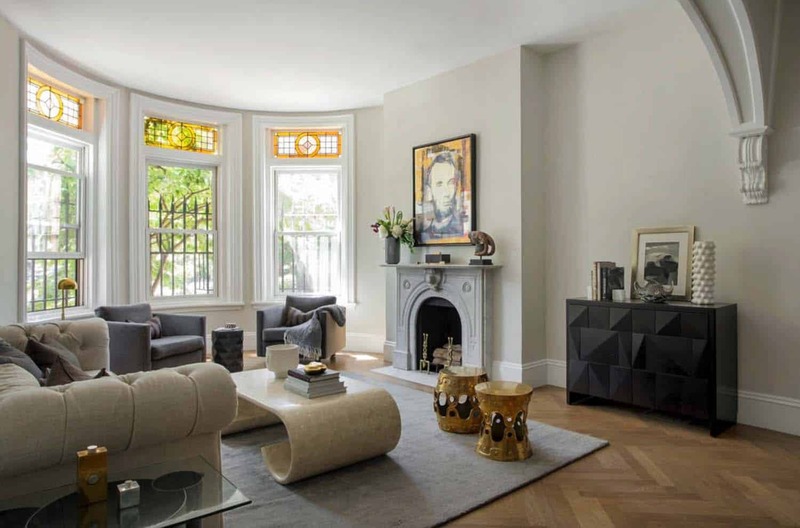 Tanya Capaldo Designs was responsible for the complete gut renovation of this Boston Brownstone, transforming it into her own personal living quarters. The home was originally constructed in 1885, described by the designer as appearing like a mid-70’s Brady Bunch. 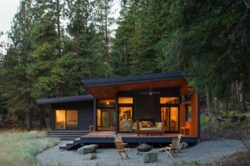 The home encompasses 2,000 square feet of living space, with two bedrooms and two bathrooms. 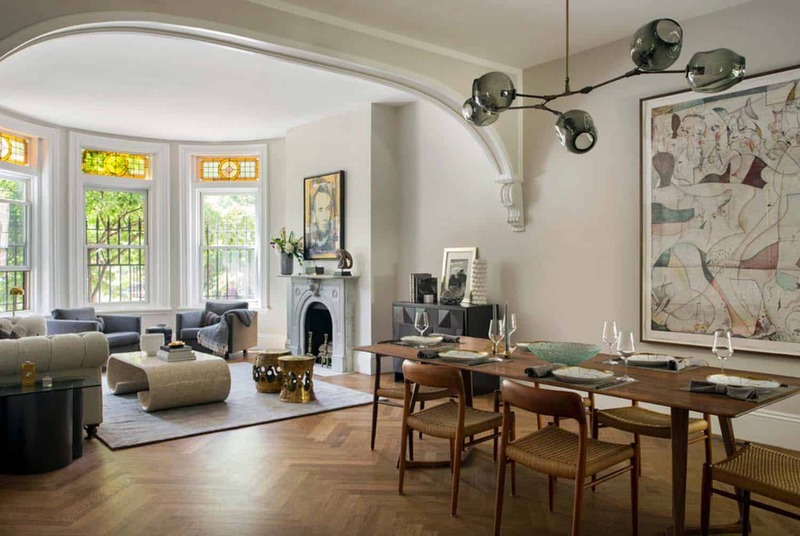 The flooring in the foyer, living room and dining area is stained white oak in a herringbone pattern. The pattern creates an elegant feel to the space, while honoring its historic past. The only thing that was left original to the space is the exquisite stained glass windows. The original millwork, fireplace and the flooring underneath the shag carpeting were not worth salvaging. The new salvaged marble fireplace surround adds to the charm of the space; as does the new archway the creates a visual separation between the living and dining room. 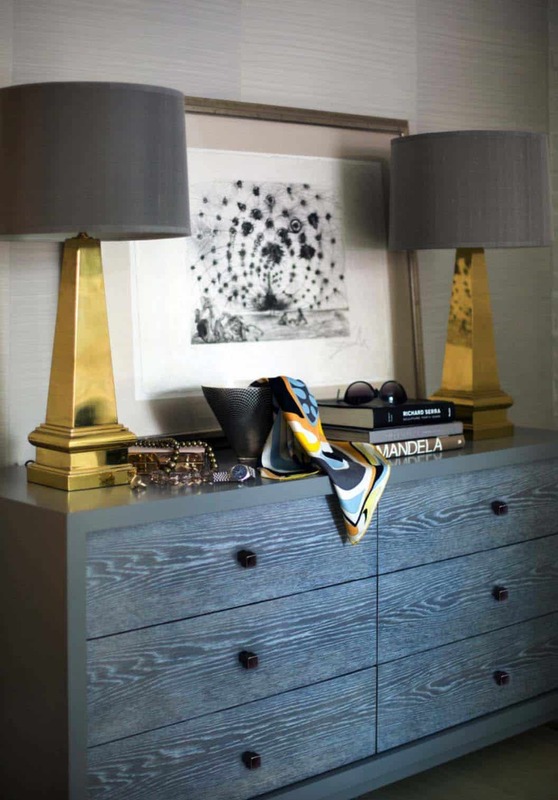 The paint on the walls is Benjamin Moore—Light Pewter 1464. 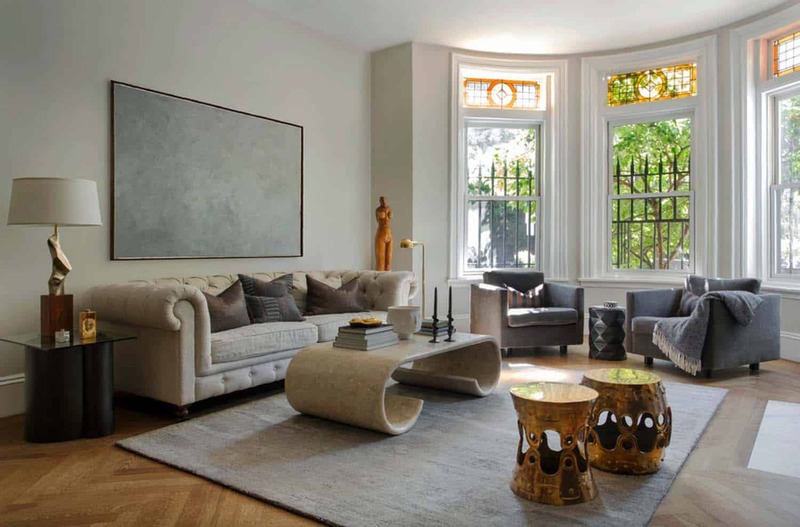 The sofa was sourced from Restoration Hardware, while the pair of midcentury cube chairs are by Charles Pfister. Above: The marble fireplace surrounded by spotted at an architectural salvage yard. 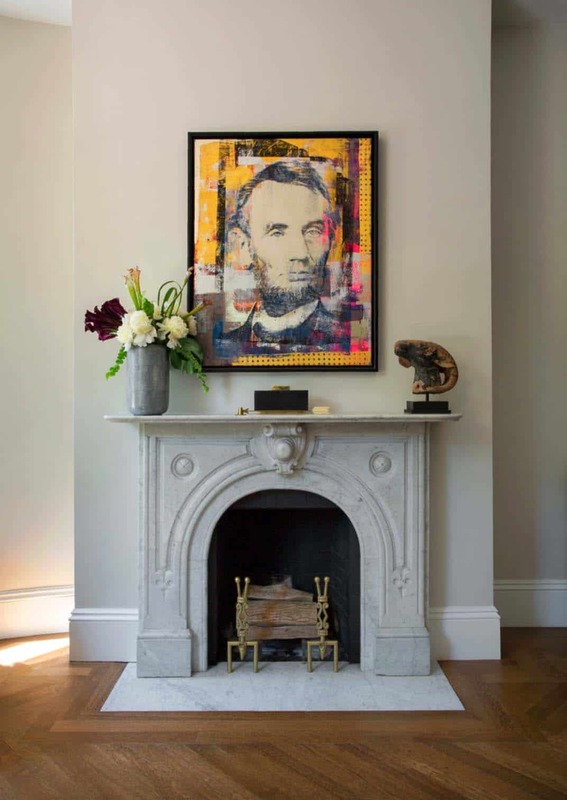 Hanging above the mantel is a colorful framed artwork of Abe Lincoln by Houben R.T. (acrylic and foil on canvas). 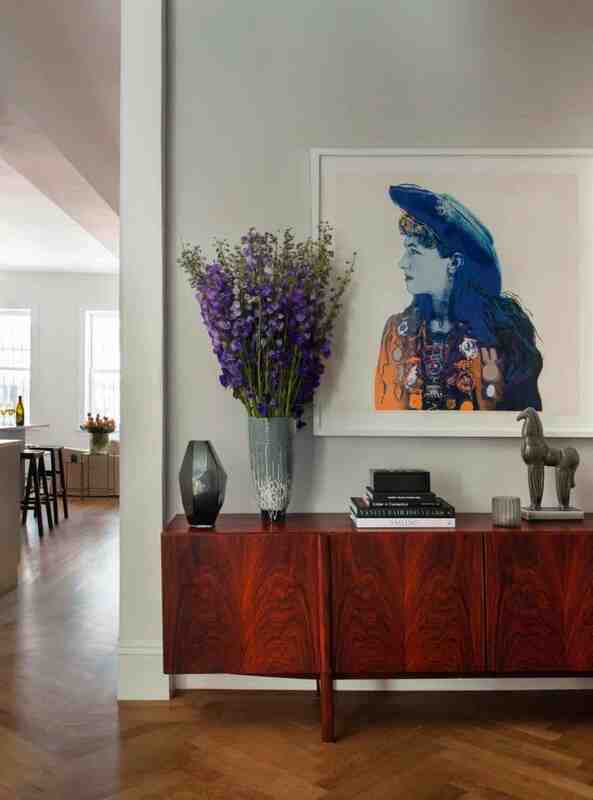 What We Love: This Boston Brownstone features a wonderful eclectic style—an amazing mix of old and new. From all of the fantastic vintage finds mixed with designer pieces, there are so many elements in this home to delight the senses. The designer did a beautiful job of staying true to the original interior architecture… all the way down to the hardware! 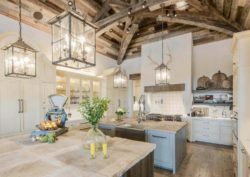 Loving the kitchen, with the French and Italian influences. 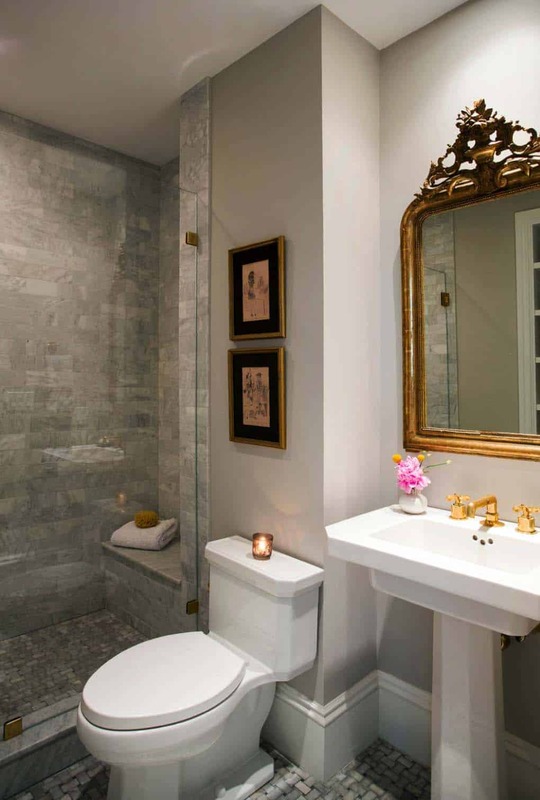 The use of marble throughout several of the spaces adds a nice touch of elegance. 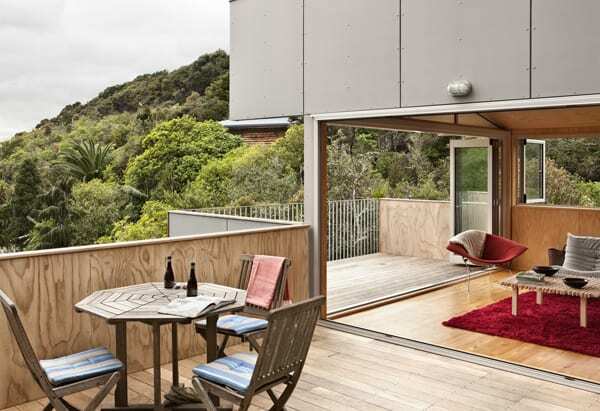 Readers, please share with us your thoughts on the transformation of this home. Do you think it was a success? Is there anything you would like to have seen done differently? Let us know in the comments below, we love reading your feedback! 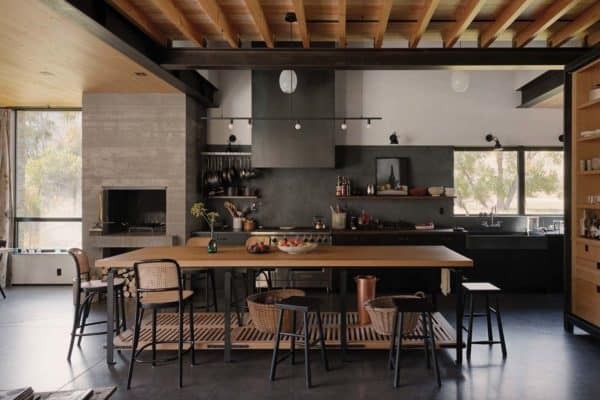 Above: The designer has slowly curated all the pieces found throughout her home, which she shares with her significant other. The couple have a fine appreciation for art, both two-dimensional and sculptural. 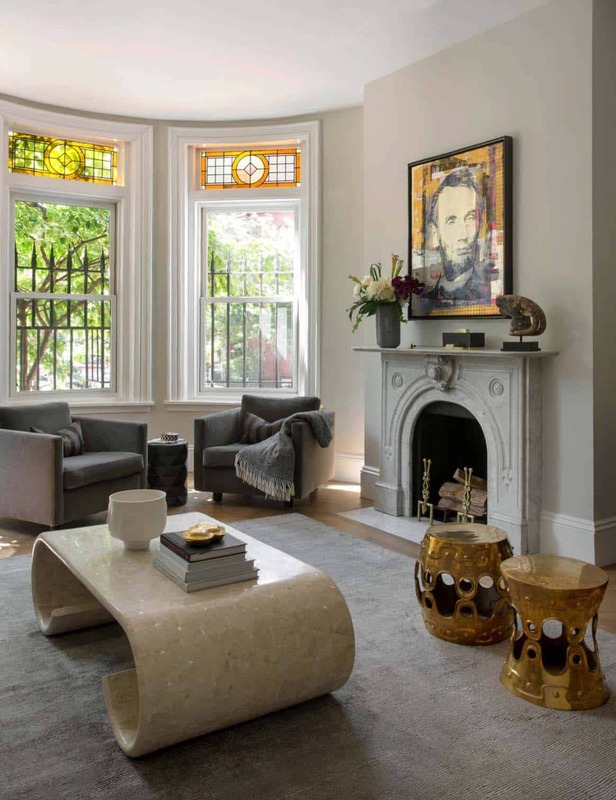 With the Abe Lincoln artwork above the fireplace on the opposite side of the room, she is still looking for something to compliment above the sofa. Meanwhile, she has created a placeholder, a framed canvas she painted gray. 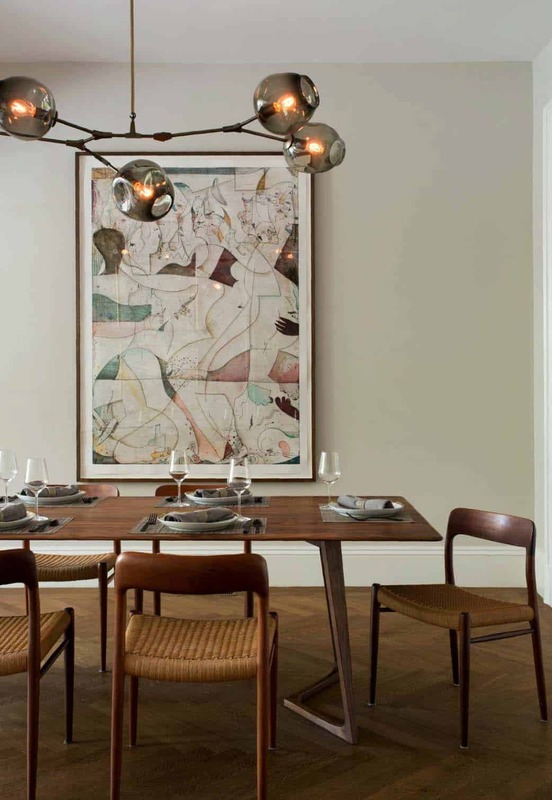 Above: Suspended above the dining room table is a Lindsey Adelman 5-light chandelier from the Branching Collection. Above: There was once a wall that stood between the dining and living room. 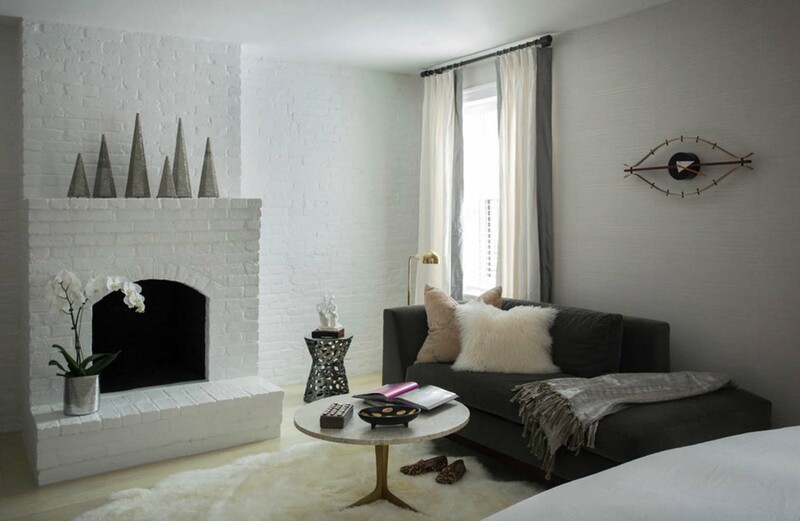 The designer had this wall torn down and in its place, she created an archway. 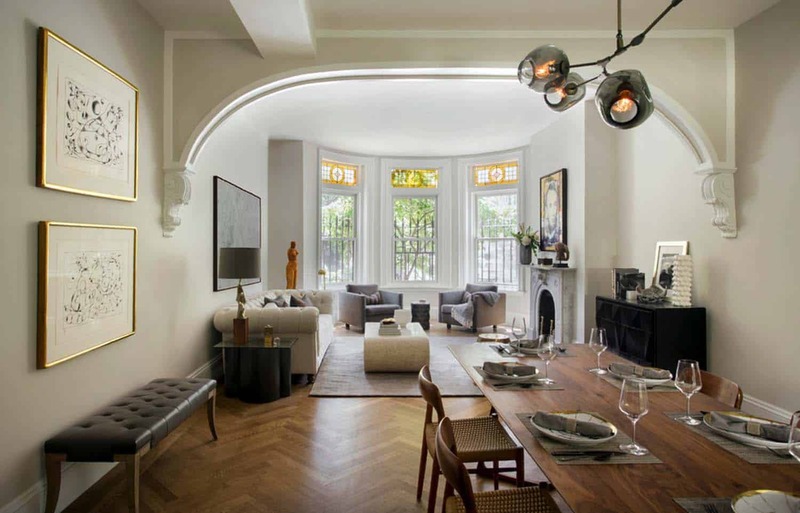 This helps to respect the architecture’s past, while updating the space with an open layout. The corbels at the ends of the archway were picked up at a local antique shop. Above: The dining table was sourced from Casa Design Boston. The teak dining chairs are mid century modern antiques by Moeller P75. The mirrors behind the built-ins have a custom antiqued finish. 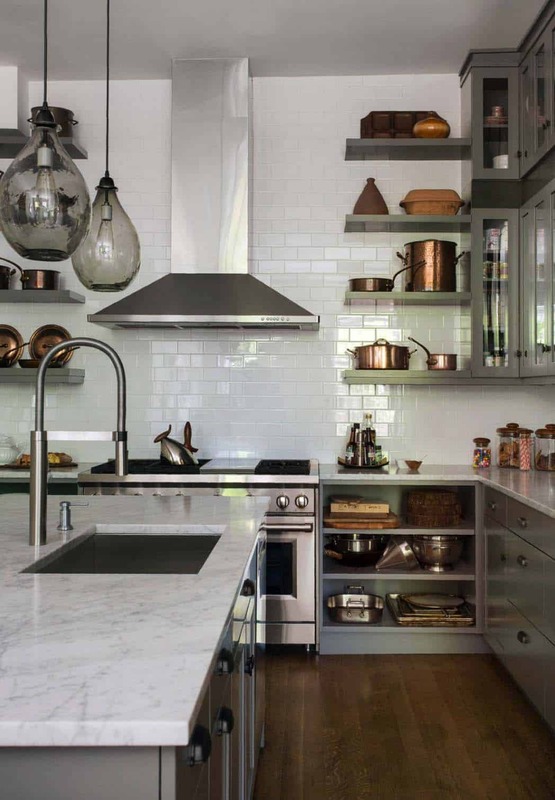 Above: In the kitchen, the pendants above the island are from Cisco. On the island, the sink and faucet were made by Blanco. The library ladder was custom fabricated out of cold rolled steel. Antiqued bronze hardware blends with the grey cabinetry, clean-lined and simple. The wall paint in the kitchen and family room is Seapearl 961 | Benjamin Moore. Above: The kitchen features high-end appliances such as the 48-inch Wolfe range with a grill. 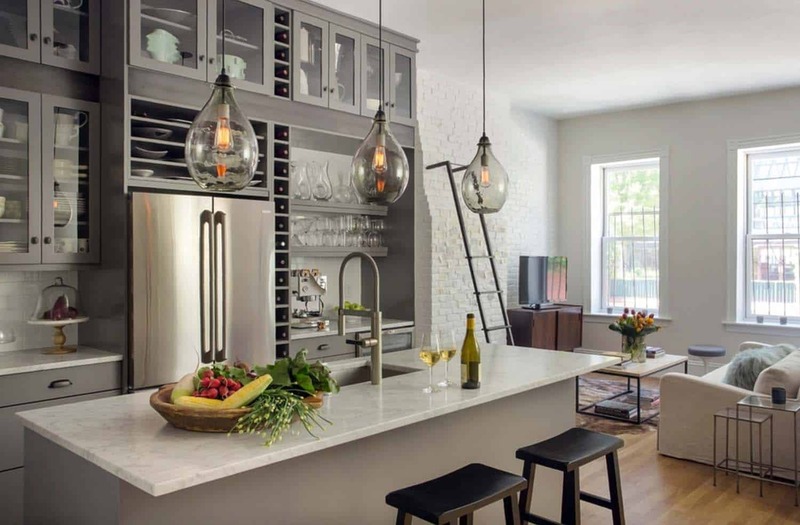 The Carrara marble countertops adds elegance to the space. A fantastic tip the designer learned from the owners of Barcelona restaurants to clean marble countertops: cheap vodka! 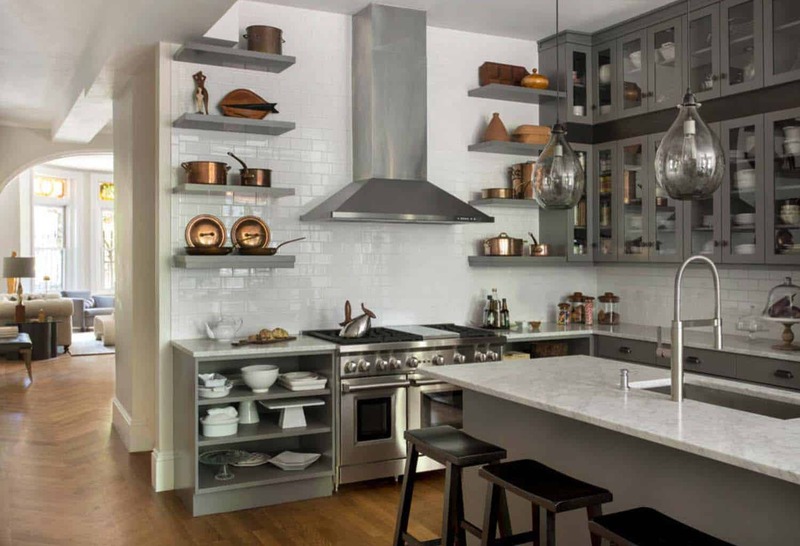 Above: The open shelving above and below on either side of the range was inspired by the designer’s travels to Italy and France. The copper collection was specifically inspired by an unforgettable kitchen in France. 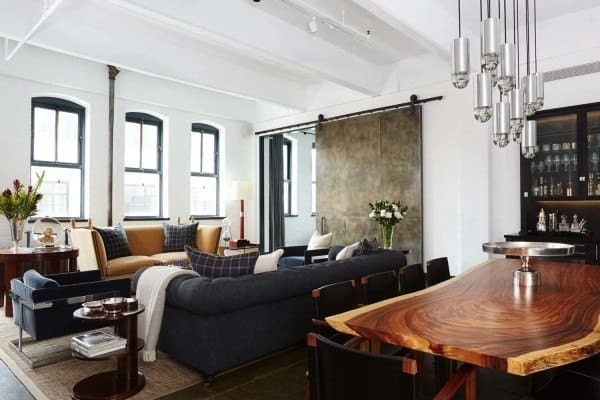 The designer likes to mix luxury with more budget-friendly finds from retailers such as HomeGoods. Above: In the master bedroom, the designer had fun mixing high and low end pieces, such as the bed from Room & Board, and nightstands from West Elm. 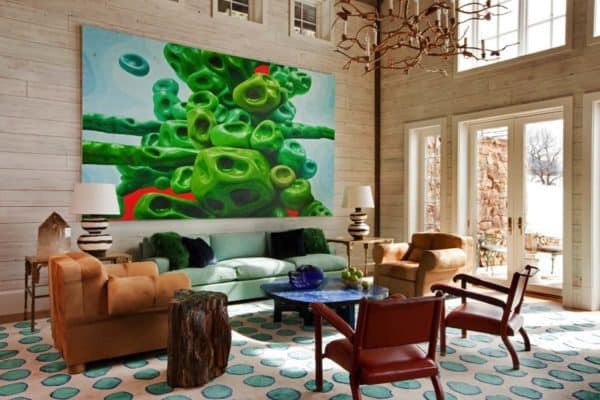 On the walls, she used a striated paint technique, which mimics the look of grass cloth panels, adding a subtle texture to the space. The gray is very calming in this space. The flooring is cerused oak, which was bleached to take out the yellow tones and then stained in clear white. 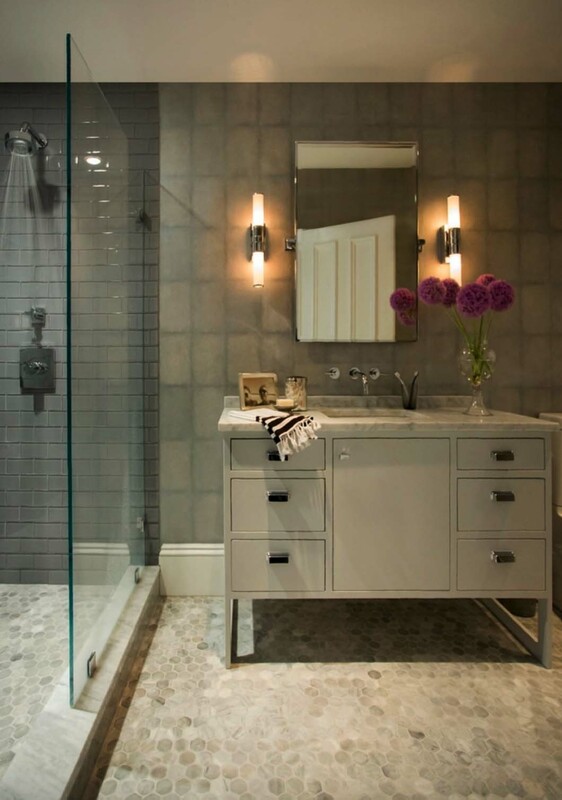 Above: In the master bathroom, the glass enclosed shower feature gray glass tiles. While the flooring is hexagonal Carrara marble tiles. 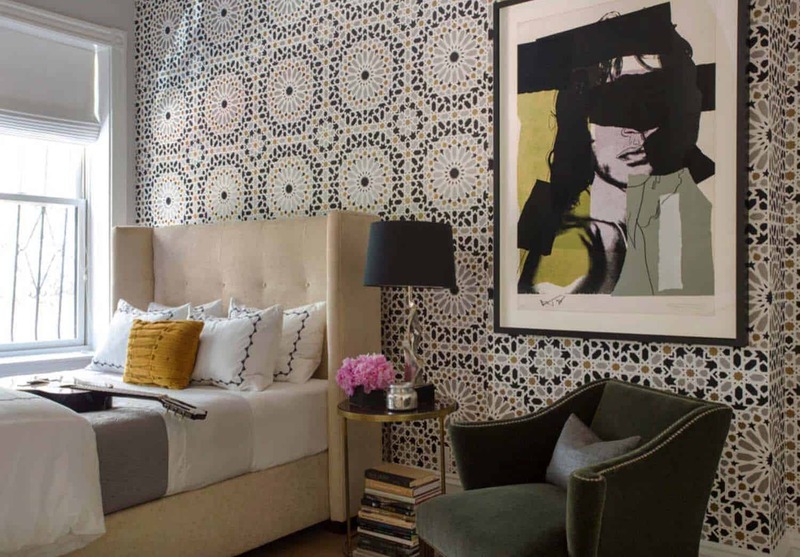 The wallpaper is handprinted shagreen wallpaper from Anya Larkin in NYC. The walls sconces are from Restoration Hardware. 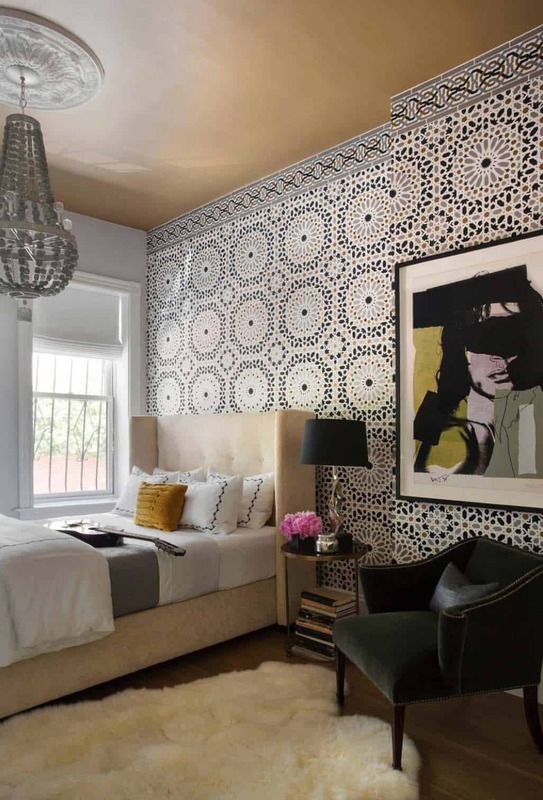 Above: In the guest bedroom, the Moroccan graphic patterned wallcovering is from Schumacher. The Mick Jagger painting is by Andy Warhol. Above: The designer paid attention to every detail, including the door hardware. The original Victorian-era hardware was made in Branford, Connecticut. 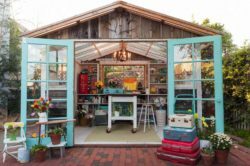 She found a company in Charleston, South Carolina that has the original molds and purchased bronze knobs, plates and hinges for her home. 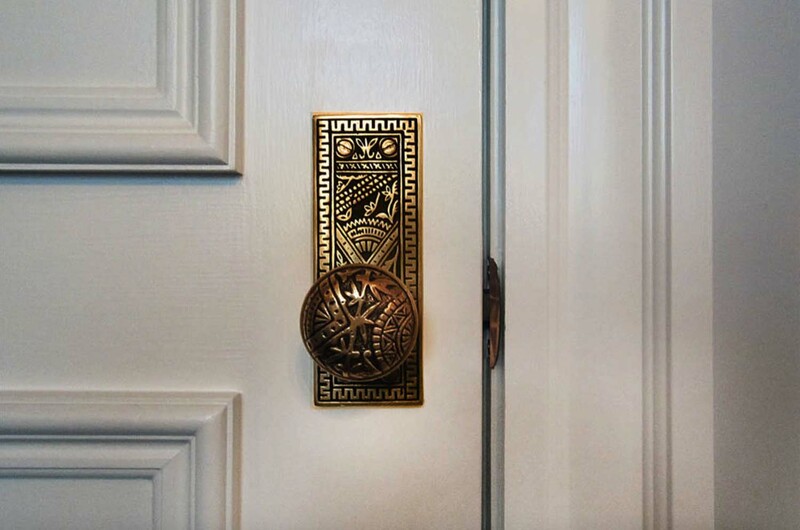 Source: Charleston Hardware: Oriental pattern. Above: The guest bathroom features Carrara marble subway tile in the shower and basket-weave patterned flooring.